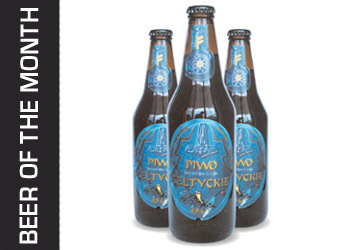 Long, long ago when the world was young and fresh and we were only slightly jaded reviewers of Polish beer, the Krakow Post’s Beer of the Month jury stumbled across a remarkable beverage called Lubuskie Zielone. For those of you who can’t remember as far back as February, let me refresh your memories – it was very green, very tasty and, most remarkably of all, came in a green bottle that completely disguised the fact that the beer itself was green. We marvelled at this at the time, then moved on with our lives comforted by the knowledge that there was an unacknowledged genius working at Browar Witnica. Fast forward six months to find the Beer of the Month jury metaphorically slumped across a bar, up to their knees in empty dreams and drained bottles of disappointment – and also actually slumped across a bar. Disappointingly, it wasn’t blue. The Willy Wonka of Browar Witnica has not taken the path of the Trekkie and recreated Romulan Ale, instead he has done something much more extraordinary – created a porter that I actually like. There is something about porters that offends me. It’s the way they look dark and heavy and also taste dark and heavy – they are the charmless mahogany furniture of the beer world. Piwo Celtyckie isn’t like that. It’s looks like it’s going to slip from your grasp and crush your feet as you struggle to manoeuvre it up a flight of stairs, but it tastes like a balsa wood piano speckled with morning dew, if you see what I mean. Heavy beer that tastes light – square sweets that look round: Browar Witnica should be watched.